PyCon India 2015 was my first PyCon as an attendee, speaker & volunteer. When I first heard about PyCon in BangPypers meetup, I thought PyCon India is just like a big meetup with a little bit of planning & preparation. But by the end of conference, I have realised that organising PyCon is a very very huge task. It needs a great deal of preparation, planning up things and dedicated volunteers who are interested and patient enough to spend lots of time to run it. Nicholas Tollervey was keynote speaker. He came to venue on October 1st(two days before conference) and helped volunteers with some tasks. He did the same on next day too. I was wondering whether he came for key note speaking or volunteering. I have been talking to many people on mailing lists, github and other channels. Finally I was able to meet & talk with many of them in person. It was good to see some of 2nd & 3rd year B.Tech students, who were familiar with django & were contributing to many upstream packages. Some students were even using Emacs as their editor. 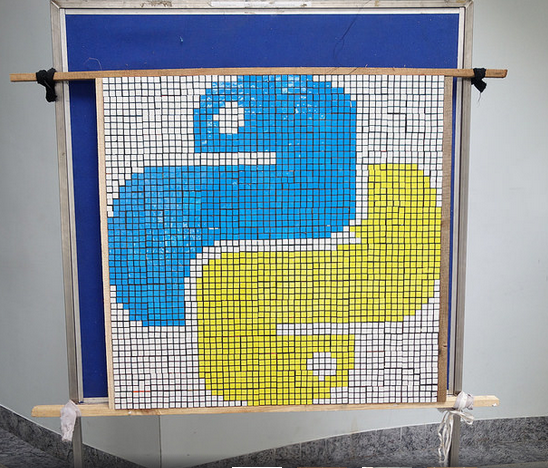 I have planned to make Python logo mosaic with rubik cubes. I thought it will take ~10 hours to complete it. When I got there with cubes, Vignesh U, Apoorva, Ram Mohan, Sayan Chowday and many other volunteers came forward and completed it in an hour. I was eagerly waiting for PyCon India from past few months. PyCon India was just like a cool breeze! Ah...!! How the hell did I forget about swag kit marathon? Day before conference, we had to prepare swag kits for participants. I don't know whose idea it was to prepare it like this, that but it was brilliant and most fun part.